PlateRite HD 8900N-Z/S/E | SCREEN Graphic Solutions Co., Ltd.
Industry-leading productivity, ideal for rapid turnaroundThe high-end PlateRite HD 8900N-Z features a 1,024-channel imaging head that utilizes GLV™ technology and is able to output 70 plates* per hour. 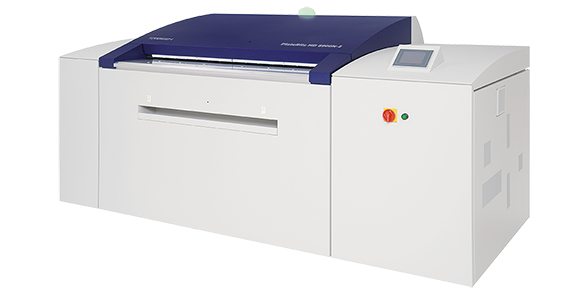 Additionally, with A4 size 4-page plates (650 x 550 mm, 25.5" x 21.6"), it is capable of impressive high-speed output of 80 plates per hour. 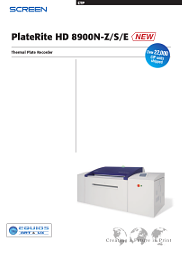 A single PlateRite HD 8900N-Z can also replace output of A4 size 8-page or smaller plates using multiple CtP units. This makes processing easier to manage, and running costs and liquid waste are lower than ever. Outstanding reproduction, cutting-edge exposure technologyUse of the GLV-equipped exposure heads creates significant improvements in the optical system, producing more uniform distribution of illumination. A high-precision auto-focus mechanism also enables output of SCREEN's proprietary Spekta 2 hybrid screening and Randot X 20 (20 μm) FM screening. The high-definition S and E models support ultrafine AM halftone dots that provide a maximum resolution of up to 700 lpi. Tuning also enables output using Randot X 10 (10 μm) FM screening. Together these features deliver the extremely high quality required for detailed output such as art printing. Gentle on the environmentScreen assesses the environmental impact of all its products as a form of design review. The PlateRite HD 8900N series has been developed with the goals of minimizing energy use and environmental impact while maximizing safety. air fi lter unit (AF-180N), upgrade to Z or S specifi cations. *1 Plates wider than 590 mm (23.3") and narrower than 610 mm (24") cannot be used. *2 Plates that are 0.4 mm (15.7 mil) thick must be 900 x 770 mm (35.5" x 30.4") or larger. *3 1,200 dpi uses 2,400 dpi double dots. *4 Option must be selected before the unit is shipped from the factory. *5 Over four consecutive exposures on one plate at 23°C (73.4°F) and 60% relative humidity. *6 This value is for when an autoloader is connected. Productivity may vary depending on the sensitivity of the plate. *7 The North American specifi cations may be single phase 200/208/220/230/240 V, 8 A, 1.4 kW. *8 One of the options must be selected. Consult a Screen representative regarding throughput when the plate insertion table is chosen.